Jasper Co., Missouri was the scene of turmoil before, during, and after the Civil War. After Order No. 11 was issued, southern-sympathizing families were forced out of the State. As a result, many families fled Missouri to resettle in the South. Grayson Co., Texas was a popular area for resettlement. Some families remained in Texas and did not explore other locations. Some stayed there briefly, only to relocate to states such as Arkansas. Those who settled in Arkansas either remained there for the rest of their lives, or they relocated to southern counties in Missouri in the late 1880s or 1890s. Since Jasper Co., Missouri was a center of Union activity and sentiment, few southern supporters returned there. If they did, they risked their lives. 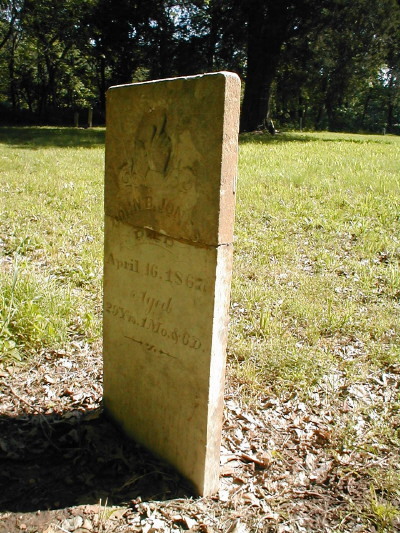 Such was the case of John Bass Jones, who was shot and killed in the early morning hours of April 17, 1867 by unknown assailants in Jasper County. Bass (as he was called) left Missouri with members of the Jones and Hood families and appears to have settled at Sulphur Springs, Benton Co., Arkansas. As reported in an earlier article written on him, he also settled in Saline County, Arkansas, where he met and married his future wife. (Click HERE for the earlier story written about John Bass Jones, his family and his wife.) He returned to Jasper County in 1867, apparently planning to stay there. Instead, his bullet-riddled body was found on the road. Unknown assailants took him from the house where he was staying and fired 11 bullets into him. A coroner’s inquest was held immediately after the killing, but no one was charged. Then the whole case suddenly came to life again in 1880. A number of prominent men were charged with the murder, and prosecution of the murder case was detailed in the Carthage Banner. I have incorporated the newspaper account below. Prosecution of this case was conducted by prosecuting attorney McIntyre, assisted by W. C. Robinson and A. L. Thomas. Defense of the case was in the hands of L. H. Waters. U.S. District Attorney for the Western District of Missouri, and T. B. Hanghawout and W. H. Phillips. The state after the forty men were qualified, called Geo. Miller, and asked him whether he had said anything about the case after he was qualified. He said that Wm. Motherspaw said to him, that the case would be short, as one of the witnesses had a bad character; also, that he had no prejudice or bias for or against the defendants. Jasper said that he talked with him and said he did not like to be kept away from home, that the case would not amount to anything, as one of the witnesses has a very bad character; that is all he said about the case. The court then excluded Miller and fined him ten dollars [for comments made] as to Smith and Flemming. I was at John D. Jones’, seven miles south of Carthage, in April, 1867. J. D. and his wife, James Jones was there on the night of April 16th. Knew John Bass Jones in his life time. He had been in the county but a short time prior to that time. He left this county in 1866 and came back in 1867; he remained a week and went to Arkansas, remained about a week and came back on the night he was killed, came to John D. Jones, a fact; came from the direction of Wm. Hood’s. I was awoke by some one calling out. J. D. Jones called out that John Bass was in the house. They said, tell him to get up and come to the door. John Bass got up and asked them what they wanted. They said they wanted him to go to town; he said he had no horse; they said they would furnish him a horse. He then came back and dressed, went out, and the last I heard him say was, even if I had done anything to die for, I would not care. Did not know any of the parties. He went out the west door; about five minutes after he was taken out I heard shots; seemed to be two volleys; saw the body next morning. The body was lying on its back, was eleven bullet holes in it. The house is on the west side of the creek. We were all sleeping in the same room, about twenty feet square; it was a light night; I saw some parties pass the window on the east side of the house. Wm. Boss lived on the widow Jones’ [Note: Milly Catherine Spence Jones, wife of Lewis Jones] farm in Newton county. John Bass claimed one-fifth interest in the farm at that time. I stayed in bed all the time until I heard the guns fired; then I got up and left. The doors were in the center of the house, on the east and west side. John Bass and myself slept in the south east corner. John David Jones was the man that said we were in the house; don’t know whether John David Jones got up or not; can’t tell whether Mrs. Ady was up when the men were there or not; think she was after the men had started from the door. This was about twelve miles from Granby; the road where the body was found is the road to Granby. We had a stable. John Bass did not bring his horse; did not recognize any of the men that passed by window; don’t know how many men were there were. I am twenty eight years old in August; live in Jasper County; lived at John D. Jones’ April 1867. Saw John Bass Jones there in April of that year. John Bass came there the night he was killed. Went to bed early. I slept upstairs. Did not wake during the night; got up in the morning, before day; saw Jones dead in the road, about two hundred yards from the house in the road. There was eleven bullet holes in the body: two in the body, one in his ear, one in his chin, and several in his leg. Defendant Greer lived about four miles southeast of Jones’ at that time. Boss lived about three miles. I saw Mr. Boss pass by our house the next morning; he stopped a moment and then rode off. This happened in Jasper County. I was not awake that night; they called me the next morning. There was no one to bed when I went to bed. John Bass came there about a week before this, on a black horse, he went to Arkansas on said horse. He came there before breakfast. Don’t know whether he had had his breakfast or not. Live six miles south. I lived there in 1867; was acquainted with John Bass Jones in 1867. The last time I ever saw him alive was in April, 1866. I saw his body afterwards in 1867, at the house of John Davy Jones; died in 1867, April 17th. On the night of the 16th I was on the bottom of the forks of Jones and Center Creek, hunting turkeys. When I started down it was clear; when I went home, it was twelve or one o’clock and clear. I lived about two miles from the bottom; as I went home I heard shooting, toward Dr. Moss’s. I was then about two miles and a half from John D. Jones when I heard the shots. Saw only two shots; one went in the right ear and came out at his chin; the other in his wrist. John D Jones lived about three and a half miles southeast of me. Wm. Hood lived about one-half miles from Jones, south. There was a right smart yard around J. D. Jones at that time. On the west side of the house there was a locust tree. John Bass Jones was about twenty-eight years old. I was friendly with the Joneses. I have lived at where I now live since the war, except two years. Reside in Newton county; have lived there since August, 1866, about three miles from Wm. Boss; two miles east and one south. I was introduced to John Bass Jones by Mr. Boss, in March, 1867, I think. I recollect he was killed in the spring of the year, the same spring I was introduced to him. Mr. Boss said he was interested in the place he, Boss, lived on. The day before Jones was killed I was in the timber, north of Mr. Boss’ home, sawing timber. On my way home, I passed along the north end of Mr. Boss’ home. Boss was close to the barn, leading a horse. We saw Mr. Boss and we went to the timber and Boss said it was all right to cut the timber. Mr. Jones said it was all right. Mr. Jones asked Boss if Jones had left us a French Furlough. Boss said he had heard so. When we saw it was at the house as we went home, Haines said, Boss, I thought Jones had left the country. Boss said yes. Haines said, I saw him but a short time before going up to Hood’s to stay all night. I said Jones said he was moving to Carthage. Boss said he must be seen to. I think that was all that was said. After we got across the creek I saw someone ride up the creek south; think it was Boss. He was riding toward where Greer was living. I told Boss that Jones told me that he had the power of attorney to bring suit to set aside deeds where property had been sold on bogus attachments, where parties were out of the country. The amount he had to settle was about forty or fifty thousand dollars. I went over to Boss’s to buy corn when I was introduced to Jones. I next saw Bass when I went over after ??? took out tools. We stopped at Boss’s to get permission to cut a couple of trees. Boss said it was all right, that Jones had no objection. We saw Jones in the evening. Jones asked us if we knew whose timber we were cutting. I told him we had bought the timber of Boss. Jones said it was all right. I did not know it was John Bass Jones until two days after. Jones was riding a horse. He went north when he left. The horse was a bay or sorrel. When I went to Boss’ house in the evening, Boss was just leading a horse in the barn yard. I told Boss that Jones said he had the power to attorney to bring a number of suits for land in Jasper county that had been sold out on bogus attachment suits for damages against parties who had left the county. JAMES H. JONES was by the court recalled for the purpose of permitting a juror to ask him a question. H. C. Warner, juror, asked him: What relation was John Bass Jones to you? My uncle. I went to Buckingham’s that night, and told them what I thought had occurred. State asked him what trees were on the west side of the house? Two–one locust tree and apple tree. My name is Elizabeth Ady. Live in Carthage. Lived on Jones Creek in 1867. My name was Jones. Question: Did not Wm. Boss make a motion while you was setting–make a motion at that meeting–some time in March or April that John Bass Jones should be killed. Excluded. Don’t know whether Boss said anything more. Samuels and Smith said something about running Jones out of county and killing him, etc. There seemed to be considerable animosity against someone; don’t know who it was against. I told Boss that I would see Jones about it and he said nothing. Don’t know who took the chair when I left. Don’t think there was any motion or proposition to kill Jones that night. All that I know about it, I have stated. There was considerable excitement. I don’t know whether Collins or Greer was there or not. Don’t think there was a motion or even a proposition for a motion to run John Bass Jones out of the county, or to kill him. We had another meeting about two weeks after that. We organized in April, 1866. We had a meeting on the night of the 16th of April, 1867; lasted until after 9 o’clock; it was at the school house about one-half mile from my house. Wm. Spencer was there; don’t think David Collins was there, or James Greer; heard someone speak; thought it was Boss; it was at the door; I was in the back of the house; don’t know whether it was Boss’ voice or not; after the conversation had passed, heard a horse going up the hill. Our society was called the Union League; about one hundred members. We let everybody in who wanted to join. The organization was not to do anybody any harm, but to protect our property. Boss asked me whether John Bass Jones had not better be arrested. The business we wanted attended to was to petition the Legislature to remit interest on some older debts for which I was security. Think this is why I left the chair. I know Nathan Smith and Lee Burlingame. Did you not say in presence of Mr. Burlingame and Smith that you heard Jones’ name mentioned in the Union League? Did you not state in presence of Thos. Wakefield yesterday that Bass was not at the meeting and that he did not ride up to the door? I held the inquest over the body of Jones. I was J. P. at the time. Boss’ wife was sick at that time; he came after medicine on the 16th of April, 1867. William Spencer’s wife was sick also. Mrs. Ady and Mrs. William Hood were witnesses at the inquest. I knew all about this matter then that I know now. Mrs. Hood was a sister of John Bass Jones; Amos Buchannan’s wife and John Bass Jones’ wife were brother and sister; also Mrs. Hood and John Bass Jones. I reside in Cherokee county, Kansas since 1874. Know Dr. Moss, know Wm. Spencer, knew them first in the summer of 1867. I joined the organization in 1867 after the killing. Know Wm. Boss and David Collins. I attended two meetings in July or August, 1866; we took an oath that did not amount to much; we signed a constitution for mutual protection. Spencer told me during august, 1879, on Dave Spence’s [Note: William David Spence–my second great-grandfather]] fence. I was talking about the killing of this man. He said, “Are you a member. I can tell you.” He said, “We had a meeting. Dr. Moss was president, and would not put the motion to kill Jones; and after the crowd had gone out of doors, some one came up, and he, Spencer, said as Moss would not give the order to kill Jones, that he, Spencer, would have your men ready; I say as vice-president, to go on and do it. I don’t know who it was that Spencer said asked for the order. I first came to the country in June, 1867. Soon after joining the league; I was a Democrat at that time, but they did not know it. I recollect of seeing Smith, Gibbens and Dr. Moss at the meetings. I told the conversation I had with Spencer; to Laz Spence and Dave Spence and all over the country. They met at Moss’ spring; when I met with them. I wrote the conversation down a few days after. Bro. Boss, Mr. Buchanan, Nathan Smith, and Mr. Boss asked me who had told me, I said I would not tell. I did not deny knowing anything about it when they came to see me. Some of the men came armed; some one says Boss was the spokesman, and wanted my authority, but I told them I would permit my right arm to be cut off first. I was living on Jones’ Creek in 1867, about one mile from Wm. Hood’s; knew James Greer, David Collins and Wm. Boss; had known them but a short time. Knew John Bass Jones; saw him last on the 16th day of April, 1867; come a foot from the direction of Wm. Hood’s. Think Dan Jones went to bed first; can’t say what time the men-folks retired that night. The beds were in the south end of the house–one in the west and the other in the east corner. The first thing I heard was a rapping on the house. I spoke to my husband, who spoke, and asked what they wanted; they said we want you to come out. I did not want him to go out. They said if you come out and act like a man you shall not be hurt. He opened the door; they asked who was there, and he said John Bass and J. H. Jones. John Bass went to the door. They said we want you to go to town; he said he had no horse; they said we will furnish you one. He put his clothes on and went out and they surrounded him. I heard him say that if he had ever done anything to be killed for he would not care. They started off with him and I soon heard what I supposed to be fifteen or twenty shots; afterwards I thought I heard horses going east and south. Wm. Buchannan was standing at the door. I recognized Nathan Boss, Wm. Boss, James Greer and David Collins; David Collins at that time wore his mustache blacked. They had small arms in their hands. Hood’s wife was a cousin to John Bass Jones. I married Davy Jones in 1860; it was about two weeks after John Bass Jones came back before he was killed. He went to Arkansas. John Bass Jones did not make his home anywhere after he came back. I had got asleep before I was aroused by the men. John B. Jones had a great many relatives in the neighborhood. He went out the west door. I was getting out the side of the bed; and saw Wm Buchannan through the window; I had my dress on when I went to the door; I saw seven men in all; don’t know who the others were; can’t give any description of them; can’t tell how the men were dressed. I was present at the inquest next day, and swore that I did not know any of the men. Question: Did you not tell Mrs. Furggason that you did not know any of the men that killed Jones? Ques. Did you not tell Ruban Dall the same thing? Ques. Did you not tell Mrs. Southerland the same thing? The first time I told any body who the men were was last fall; I told Pike, who was at that time detective and deputy sheriff. After Jones was killed my husband died, I married Spencer; after I parted with Spencer I went to Galena in 1877, and went by the name of Jones, though my name was Spencer. I lived on Red Hot Street, Galena. When I lived in Galena I married A. J. Ady; I went to Elk county, Kansas, from Galena. I saw David Collins at our house; he was with his brother who was hung near Lamar. Pike was at my house when I first told him this. He spoke to me several times about making the affidavit. Did you not refuse to sign the affidavit against these men when you went to Squire Brown’s office, and did not Pike take you in a private room and talk with you before you would sign it. Objected to and objection sustained. I said I was afraid to tell, but no one threatened me. I don’t know why I was not afraid to tell Pike. Know defendants; live eight miles southeast of here, two and one-half miles from Jones Creek; came there in April, 1866; Greer and Collins pointed out to me day before yesterday; never saw Greer before; saw Collins once before; didn’t know Jones; two days after killing heard of it in town. I was not acquainted with any of the defendants but Spencer; did not get acquainted with Boss till 1870. I met Spencer some time in 1867 or 1868 on the prairie, and we had a conversation in relation to my membership in a certain organization. He wanted to know whether I was loyal. I told him I was loyal to the United States, but not to the organization. All the conversation was about my allegiance to the organization. It was called the Advanced Guards of America, and held their meetings at the Moss School House. Don’t know whether Spencer was a member or not. I belonged to that organization. I did not know any member in the order. Mr. Spencer said Jones was killed because he was kicking about the cutting of timber on his land; that he did not allow rebs to come back and make threats. I resided on Jones’ Creek in April 1867; lived there until the 16th of April; knew John Bass Jones; he left that county in April, 1866; the next I saw him was March, 1867; stayed a week and went to Arkansas to see his brothers, and come back April 16th, 1867, about three o’clock that day was on horse back; stayed till dark; left his horse and went I don’t know where. His horse was in my lot; know Boss, Collins and Greer; saw Collins and Greer pass my house that evening; they passed close to where the horse was; Jones had left before they came back. I saw two persons going toward J. D. Jones’; after that I heard the dogs bark and got up and went to the door; some one knocked at the door. I opened the door; saw pistols cocked. They said “Come out.” I did; three men went in and one guarded me; the men that asked me to come out and turned and asked me who was in the house. They went in, searched the house, came out and went away. They then came back and asked me where John Bass Jones was. My wife said they had gone down to John Davy Jones’s. They turned and walked off; I went back in; they came back again, called me out and asked me to come round the house; saw four men; was getting over the fence, and Collins came up to me and asked me whether I had ever ordered any Union men out of this county or took Union men’s property. I said no. He then said he did not want me to run around any more; that is, unnecessary running around. My wife came to the door, and he then told me not to leave the house until daylight. I only recognized Greer, Collins and Buchannan. They had been gone about one-half hour. I heard pistols a little while after I heard horses’ feet on the road going south; thought the pistol shots were down the creek. the men were not disguised; they had pistols; did not see Collins have any pistols. I saw seven men in all; only recognized three. The two men that were with Collins when he talked to me I did not know. The moon was a little west that night. Live in Texas; northwest Texas; I left Texas last Monday week to come here; was here last court; stayed at Pike’s house and McBride’s house–went out some and mostly after night. Mr. McAntyre sent me money to come here–was in Weatherford, Texas, when I got the money. John B. Jones was riding on a black or brown horse when he came to my house. Got to my house on the 16th, about three o’clock. The men came to my house at about 12 o’clock or after, at night. I went to Jones’ next morning and stayed until night. It is one mile from my house to Boss’. I did not go to Boss’ next morning and tell them that Jones was dead. I did not tell Boss ??? that I did not know the men that were there that night. Lived on Jones Creek on Laz Spence’s place in 1867; was one of the jurors before the inquest. Wm. Hood was sworn as a witness. Question: Did not Mr. Hood swear before the Coroner’s jury that he did not know who the men were that was at his house? Ques: Did not Hood swear before said jury that the men were all strangers to him? I was one of the Coroner’s jury that held the inquest over the body of John Bass Jones. Wm. Hood was sworn as a witness, and testified that the men who were at his house that night were all strangers to him. Have known William Spencer since 1841; Mr. Spencer always had a good reputation; also Boss and Greer. Cross Examined: There was a large crowd at the inquest. I was at the meeting of the League the night Jones was killed. Collins or Greer was there. The League lasted till two minutes after nine o’clock; after the meeting was over, myself, Dr. Moss and William Spencer went home together as far as Moss’, then I went a short distance from Moss’ and Spencer went on home. I lived in 1866 at my father’s on Jones Creek; I remember of the killing of J. B. Jones. I was north of Hood’s or John D. Jones that night. I was at my uncle’s that night shelling corn. I was a member of the League. I understood it to be a general organization gotten up by members of the local area to protect property and enforce the law. I was at the meeting of the League at Moss Spring, when Major Baney was an applicant and he was rejected. He never was a member of that order. Cross Examined: My uncle lived about two and a half miles from where John B. Jones was killed. I never heard the name of Jones mentioned in the League and I know it was not the murder of Jones that caused the League to disband. I never was at Major Baney’s for the purpose of driving him out of the county. Re-examined: I was at the foot of the stairs when Moss said he had never heard the name of Jones mentioned in the league and had never heard any motion or proposition in the League to kill Jones or run him out of the country. Yesterday and the day before, D. Moss told me he was not at the meeting of the League the night Jones was killed. Swears to the good character of all of the defendants. Baney never was a member of the League. His name was rejected at a meeting at Moss Spring, while I was a member. My recollection is that I said I could not positively tell where I was the night Jones was killed, at the time I gave bail. Know Mrs. Ady, her and her husband were at my house last harvest, and she, Mrs. Ady, told me she did not know who killed J. B. Jones; that she did not recognize any of them and that the killing of Jones was a mystery. Cross-Examined: She said that three of the men came in the house and she did not recognize any of them; that they were strangers and not disguised. I came to this county on the 1st of March, 1867; know Mrs. Ady. The morning of the 17th I went to Jones’ house and helped to carry the body in the home and Mrs. Ady told me she did not know any of the men that killed Jones. Know Mrs. Ady; knew her in 1869, in the summer of 1869. Mrs. Ady said in my presence that she did not recognize any of the men who killed Bass Jones. She said the men were out in the yard southwest of the house under an apple tree. Know where Boss lived in 1868; there was no lane on the northwest of Boss’ house at that time. Came to this state in the fall of 1867; know where Boss live; am acquainted with the country. The lane Mitchell spoke of was built in the spring of 1869. Am a sister of defendant Collins; know Mrs. Ady; she and her husband were at my house visiting, and Mrs. Ady said she did not know the men that killed Jones; that they were black and strangers; I was living at home, and my brother was at home the night Jones was killed; also James Greer was there, and my brother was sick. I know it was that night because my sister was confined. My brother and Greer slept upstairs; the stairs were in the room where we slept. My brother and Mr. Greer went to bed early, and did not come down during the night. Cross Examined: I have been married seven years; think I was about sixteen or seventeen; think I was older at that time. James Greer stayed at our house lots of nights. The night Jones was killed I think they went to bed at the proper time. My brother and Mr. Greer went to bed first. Am a sister of defendant Collins; lived in Newton County in 1867; I remember the night Jones was killed; my brother was at home that night; Greer was there; I slept in the room where the stairs went up and my brother and Greer went upstairs to bed that night. I went to my sister’s next day to see my sister, and Mrs. Ward told me Jones was killed. My sister had been confined. Am one of the defendants; was at home the night John Bass Jones was killed; Greer slept with me. My sister told Greer that Jones was killed. I was not at J. D. Jones’ the night Jones was killed; was not at Hood’s that night. I was at home, sick. Am one of the defendants; am sixty-one; knew Jones. The night Jones was killed I went to Dr. Moss’ for medicine and went to the meeting, and went home about nine o’clock. I was a member of the Union League; had nothing to do with the killing of Jones; never gave orders to kill him and never heard his name mentioned in the League; never told Baney what he swore to. Am one of the defendants; was not at Wm. Hood’s the night Jones was killed; did not go to John D. Jones’ the night he was killed; did not help kill him, and don’t know anything about it. Am one of the defendants; knew John Jones; first found out he was killed on the morning of the 17th of April, 1867. Wm. Hood came to my house that morning and told me that Jones was killed. I was at home all night the night Jones was killed. I never suggested to the League to kill Jones, and never said anything about him. My wife was sick the night Jones was killed. John Bass Jones and I was always friendly; never saw him but twice in his life time, once when Buchanan introduced him to me, and once when he came to measure his mother’s corn. Cross Examined: Never had any such conversation with Mitchell, as he has sworn to. I did not see Mitchell all the day before Jones was killed. Am the wife of Wm. Boss. I recollect of the killing of John Bass Jones. My husband was at home that night. I recollect my husband was at home, because I was sick and he gave me medicine, and Wm. Hood came over next morning and told us Jones was killed. Cross Examined: I had been sick for nearly one year. Am a son of the defendant Boss. Am twenty-nine years old in August. I recollect of the time John Bass Jones was killed: The next morning after he was killed, Wm. Hood came to our house and told us Jones was killed. My father was at home all of the night Jones was killed. I know he was because my mother was sick, and father was up and down during the night to give her medicine, and Wm. Hood came over the next morning and told us of the killing of Jones. Cross Examined: Hood told us that morning that he had no idea who killed Jones. My father asked him if he wanted anyone to go and help hunt the ones that killed John Bass Jones. Mrs. Allen was living in the room adjoining us, and Mrs. Seanures was living in the kitchen. Am twenty four, February 26. Am a son of Wm. Boss. I recollect of hearing of the killing of John Bass Jones. Wm. Hood told us the next morning that John Bass Jones was killed; he also said that he did not know who killed him, and had no idea who killed him. I recollect my father was at home all the night of the 16ths. I live about six miles from Moss, and the same from W. Hood. In 1867 I lived on the head of Jenkins Creek about three miles from Wm. Hood. Question: Was Major Baney a member of that order in 1867. Objected to by the defendant. Over ruled. Cross-Examined. I think I have been to meetings when Baney was there, am not satisfied or positive; was not a member of the League at Moss Spring. Quest: Was you agent for the farm Boss lived on in 1867? Ques. Did you give Boss any authority to sell any timber? Objected to by the State. Overruled. I was present at the coroner’s inquest; don’t recollect whether Wm. Hood testified or not at the inquest. Live in Newton county; know Wm. Hood. I recollect the circumstances of Jones being killed. Hood left the day Jones was buried. I saw Hood start; the evening he left, he was at my house. I was present at the Coroner’s Inquest. Didn’t hear Wm. Hood testify; I think Mrs. Jones and husband were all that testified. Cross-Examined; If Noah Moon testified, I did not know it. I lived three-fourth miles west from where Jones was killed; was at the inquest. Hood left the day Jones was buried. Cross-Examined: I think John D. Jones and wife and Wm. Hood and wife testified at the Coroner’s inquest. Live in Joplin. Know W. S. Norton; he lives in Empire City, Kansas. He formerly lived in Joplin. Knew his general moral character. It was bad. I was present at the Coroner’s inquest. Could not say whether Wm. Hood was sworn or not. The newspaper account ends here. I did not find any additional articles about the murder trial. The case was referred to once again in the press when William Spencer died December 23, 1888, and his obituary mentioned that he had been one of the defendants in the case. As far as I know, the defendants were all acquitted by the jury and the case against the defendants was closed. The real killers of John Bass Jones were never found. My interest in the case has not waned however. And recently, while going through the old newspaper account, I made an interesting discovery that has taken me in a new direction. I will cover that in Part Two. “The So-Called Murder Case” from The Carthage Banner, August 1, 1880. Microfilm. Jasper County Public Library, Carthage, Missouri.